Where Did Those Dawgs Go? I’ve been told that I’m a sports optimist, so maybe the problem isn’t you, it’s me. Whatever the case, I wrote about you last week. You had just beaten a decent Colorado team to cap-off an impressive four-game winning streak. You were playing the best you had all season. The offense was still an issue but the defense was incredible. I guess that’s why I’m so confused. You built my hopes up on something that should be able to be repeated. I can understand when you are having an off night. Even Duke, the prettiest of all the teams, have games where the shots don’t fall. But somewhere in the last week, you lost those beautiful defensive rotations. Your transition defense went from being an asset to a disadvantage. All of a sudden, the worst teams in the Pac-12 were getting to the 50-50 balls way more often than you were. I just don’t get it. Did you think you could take a week off and be fine. These things take work! You shut down Allen Crabbe and Brock Motum but get killed by some freshman from Utah and Collier the Beaver? That doesn’t make sense. Maybe I did expect too much. I bought into the early season excuses of injuries and learning a new offense. I wasn’t expecting miracles when Pac-12 play started. You seemed like a .500 team to me. Then you played those four games and the expectation changed. Sorry if that’s not what you wanted but that’s what you (and me) deserved. Competing for a conference championship started to seem reasonable. You have the best scorer in the Pac-12. You have a guy who should compete for Defensive Player of the Year. You have a senior point guard who may not live up to expectations but at least plays smart basketball generally. You have a second scoring option who seemed to be a good all-around player, he doesn’t seem that way right now. You have the gritty guy, to guard the stars and grab the rebounds. You also have a few exciting young guys. Sure, scoring and depth were always a concern but that hasn’t been the real problem in the last week. Now, I’m not going to quit on you. I never have. I’ll be following along when you play the Ducks on Saturday and I plan to be in attendance next Thursday against the Wildcats. Did you know that a Wildcat is about the same size a house cat? If you can’t beat that then what hope do we have? I hope this letter doesn’t hurt you too much. I still think you have a chance to be good and you should be that .500 team I thought you were to start. I just thought we were forming something special and now it appears that it didn’t matter to you. I’ll be right here waiting, but please don’t call until you find the defense. Where Did These Dawgs Come From? I’ve noticed that us Good Guys aren’t very good about writing about sports when sports go wrong. It’s a good thing we aren’t getting paid to write about these things because once our teams start losing, we all start going to the movies (or doing something that isn’t sports related). If you would like to pay us to write though, I’ll gladly accept your money. So, on this very full sports day, I’m going to ignore the Mariners trade that I don’t really like and talk about a surging Husky basketball team. I could have chose Chip Kelly or dead, fake girlfriends but I’ve been planning on writing about the Huskies for about a week. The easiest place to start this post is with the question, “What happened to the Huskies?” The easy answer is that Romar pulled a Bugs Bunny and convinced the whole team that they are drinking something special so that they will be able to defeat the Monstars of the Pac-12. That’s probably not accurate though. Before conference play began, the Huskies suffered humiliating losses to Albany, Colorado State, and Nevada. The team had some good moments but they were overshadowed by inconsistency and a lack of play-makers. The team didn’t have an identity and seemed to be going no where. There were excuses for this, and they were pretty legitimate. Romar lost two players to the first round of the NBA Draft. The team suffered injuries to Scott Suggs and Shawn Kemp Jr. The Dawgs weren’t a deep team to begin with and these injuries didn’t help. With that to boot, the Huskies were learning a new offense this year. When you don’t have your whole team there to practice a new offense, it’s hard to learn it. The defense also suffered, as they were slow on their rotations. The Huskies played better towards the end of non-conference play but still was not consistent. The turnaround in the season may have come when the Dawgs went and played a game at Connecticut. They lost by 8 points but the defense held UConn to 65 points and the team played hard. It was clear that progress had been made. Since that game, the Huskies have started Pac-12 play 4-0. Three of those wins have come on the road. Yes, they haven’t played the top teams in the conference but they have found a formula to let them compete against those top teams. That formula is hard-nosed defense, hustle, veteran scoring, and more hard-nosed defense. Read about those after the jump! Happy New Year! 2013 is a little odd for me because it reminds me that I’ve been out of high school for a decade now. It’s probably about time I move on. Ya right! On the other hand, I am welcoming 2013 with open arms. I’ve patiently waited for 2013, and if you’ve read this blog the past couple years, you may have seen my occasional 2013 references. So what’s all my excitement over, you ask? Well, in December of 2011 I had an epiphany about the year 2013, which was that ALL 5 Seattle teams (the ones people care about), could be in position to make a run at a championship. I surmised that the UW football team, fresh off a Holiday Bowl win, would be entering year 5 under Coach Sark, and opening up new Husky Stadium, led by senior QB Keith Price. The Mariners would be in year 5 under Jack Zduriencik, and the young nucleus he was building would be established. Coming off a promising 1st season with Pete Carroll, I figured the Seahawks could be in position to really contend in a couple years, so long as they found a franchise QB—check! Lastly, the UW basketball team, and Sounders FC (entering its 5th season), are seemingly always a threat to have a special season, so across the board 2013 was, and is, looking bright. It even crossed my mind that it might be the year the NBA returns, which it could be. A large part of my optimism stems from the fact that for the first time in a long time, there appears to be stability with all 5 of our teams. In fact, every coach and GM has been on his respective Seattle team for 2+ years. I doubt many cities can say that, and what it means is that none of our teams are in a true “rebuilding” situation. There is reason for hope with all our teams, though now that 2013 is upon us, I can safely eliminate the Mariners and Huskies from winning it all this year. Still, could all our beloved teams have a winning season, or perhaps make a playoff run? Absolutely. Or, dare I say it, could 2013 be the year a championship is won in Seattle? If not this year, there’s always next year. I don’t follow high school football real closely, but it seems the Seattle area is especially potent this year. Bellevue is ranked #3 in the country by ESPN. They have one current Husky commit, MLB Sean Constantine (who unfortunately just broke his arm but should be back for the playoffs). Myles Jack is a terror at LB and RB, and while he’s currently committed to UCLA, people seem to think there’s a good chance he changes to the Huskies. That’s not even mentioning junior Budda Baker, who will easily be the top recruit in the state next year as a RB/Safety. Out in Sammamish, Skyline’s good like always and Max Browne is the top quarterback in the country. At least two other quarterbacks are Division I commits, Bellarmine Prep’s Sefo Liufau to Colorado and Eisenhower’s (in Yakima, my hometown) Kolney Cassel to Southern Methodist. I don’t know how good the teams are throughout the state, but there’s plenty of talent, led by Danny Mattingly in Spokane. He’s committed to Notre Dame, but the Huskies and others are working on him. And how about the kickers? Mt. Si’s Cameron Van Winkle will be a Husky next year, and Austin Rehkow kicked a record 67-yarder in Spokane this week. Congratulations to everyone so far, and get out and see a game if you get a chance. We’ll get more into recruiting once December and January hit, but it’s shaping up to be a fun year. The Huskies have 18 current commits, a class rated #2 in the Pac-12 right now. It’s not expected they’ll take too many more than that, but experts have speculated that as much as half the class could be different by the time signing day gets here. The good news is that the Huskies are still in on some big-time prospects. I’ll try to put up a more detailed post if the Huskies have a big weekend of visitors soon. On the basketball recruiting side, news is looking good. PG Nigel Williams-Goss, a playmaking true point type, has been committed for a while. This week, Darin Johnson, a shooting guard from California, committed. Both are four star recruits. The Dawgs will likely take two more players, and those will hopefully be forward Aaron Gordon and SG Isaac Hamilton. Hamilton is the less likely of the two, but that’s fine if they get Gordon, who is possibly the best player in the country. He’s a skilled high flyer who has been high on the Huskies for a while. We’ll see if they can hold off Arizona and Kentucky, among others. This is a hard game to pick. On one hand, the death march that is the Husky schedule is over. They are now playing teams that they probably have more talent than and should be able to compete with and get some wins. Arizona has a terrible defense and the Huskies will actually score tomorrow. On the flip side, night games in Arizona are so weird. They seem to use some sort of trickery down there in the desert. Maybe the Sun Devil helps both teams? I don’t know. I’m getting off track. Arizona’s offense is incredible and our defense is much improved. Our offense is struggling and Arizona’s defense is terrible. That all looks like a draw to me. There doesn’t seem to be a clear advantage in the special teams department. Maybe these teams will tie? You can’t do that. Today on KJR, Sark said that they’ve had this game circled on their calendar before the season started. He said that they knew the second half would be incredibly important and called this game the biggest of the year. It seems like he and his team know the importance of tomorrow. I was going to pick Arizona until I heard that interview. He won me over and now I think the Dawgs pull this one out. The defense will need to get opportunistic stops and get tough in the red zone. The offense needs to roll. There’s no other option. Keith Price can do it. The Dawgs roll into Tucson licking their wounds from the past 2 weeks. At 3-3, UW has gotten past the toughest part of the schedule, and it feels like they’ve approached a fork in the road. Tomorrow night’s game could propel the Huskies to a strong finish, and I will be rooting hard for that, but the schedule only gets slightly easier now and things could quickly unravel for the Huskies. The new and improved defense will have its hands full yet again against Rich Rod’s dynamic spread. Zona will score often, so to me this game will come down to whether Keith Price and the Washington offense can keep pace. I see a good ole Saturday night barn burner, full of entertainment, but ultimately Arizona has just enough firepower to beat this searching, beaten up Husky team. This game could very well shape the rest of the season, for both of these teams. The Arizona offense is potent, but it’s potentially a better matchup for a Husky defense strong in the secondary. The Huskies need to stay strong against an excellent running back in Kadeem Carey and find a way to muster a bit of a pass rush when Matt Scott holds the ball for any time at all. I think the Huskies can hold them relatively in check, but the question is whether they will from the beginning. That seems to always be the question with this team. This game will likely come down to how healthy the Husky offense can get against a terrible Arizona defense. I’m betting they feel pretty good by tomorrow morning. The Huskies come into their Saturday night match up with Arizona as the worst passing offense in league. Not many followers of this program even thought that possible at the beginning of the year, yet here we are. Keith Price has regressed from last season. Kasen Williams and ASJ have yet to make any significant impact on opposing defenses, and the remaining receiving corps have been very quiet. The reasons for this are manifold: the offensive line’s pass blocking has been sub par, Price simply does not look like the same QB from last year, losing starting tailback Jesse Callier and frankly the level of opponents has been strong. Throw all that together and you get a mess in the passing attack. The good news? Arizona! The ‘Cats are simply terrible defensively, ranking near the bottom of the Pac-12 in every category imaginable. U of A simply cannot get pressure on the QB, and they don’t force turnovers. This will be the first game since PSU that UW should be able to move the ball, even in light of the above negatives casting a shadow on the offense. I fully expect Keith Price to find a rhythm and have a big game in tandem with Kasen Williams, who is flat out due to have an 8 catch, 190 yard 2 TD performance. Watch for the Dawgs to run as well, giving Bishop Sankey a heavy work load. I feel really good about this game despite the traditionally notorious and bizarre effect a night game in Tuscon can have on road opponents. I think the Huskies have more talent, top to bottom, than the Wildcats, which will lead to a wild, yet satisfying win. The UW basketball season is not officially over, but it’s pretty close. Many people stopped caring when the team missed the NCAA tournament (me initially being one of them), but those who didn’t watch last night’s NIT battle royale with Oregon missed out. Hec Ed was packed for the final home game of the year, and it was loud. With Oregon as the opponent, it felt like anything but an NIT game, and it was played that way, as well. Both teams played hard and well, I would argue at an NCAA tournament level. I understand why the Huskies missed the Big Dance. Their resume probably wasn’t worthy, at least given the way the selection committee looks at teams, but I think anyone who argues that they’re not one of the best 68 teams in the country is crazy. They have been inconsistent and frustrating, but when they play anywhere close to their ability, they’re a potential sweet sixteen team. That’s obviously not going to happen this year, which is what makes them so frustrating. If you can get past that disappointment, though, last night was a blast and a good way to remember this team. The Dawgs will now head to Madison Square Garden for the NIT semifinals and hopefully final. Obviously, we hope they win, but it is still kind of hard to get overly excited. The Oregon matchup was a nice surprise, but when you come down to it, it’s the NIT. So, you ask, what’s the point of this post? I can’t really remember. I started it earlier today and can’t remember where I was going with it. I guess let’s talk about next year. Right now, the Huskies are slated to return almost everyone. They lose Darnell Gant to graduation, but get Scott Suggs back from an injury redshirt and add Andrew Andrews and Jernard Jarreau, who both redshirted as freshman this year. They have no committed recruits currently (more on that in minute). I have no doubt that that team would be favored to win the Pac-12 handily and would probably be in consideration for the top 10 in the country. That’s a lot of talent, and a lot of talent that should be improved and much deeper next year. The problem is that Terrence Ross and Tony Wroten seem extremely likely to leave early for the NBA. Both are projected for the first round. Both have some questions, and it’s a deep draft class, so it’s not like there’s no doubt they’re leaving. And to be fair, neither of them has given any indication they’re gone. Just don’t get your hopes up on them staying. In fact, if you don’t deal well with disappointment, just plan on them leaving. The power of low expectations! To break down my thoughts on the two: it would obviously be great if they both stayed. If I could pick one to keep, it would be Ross. He’s my favorite to watch, and he’s the better all-around player. Wroten is a fascinating guy. He had maybe the best freshman year in UW history and was one of the best players in the conference, but everyone knew what he would do: drive to his left, throw the ball toward the basket, and if it didn’t go in, get his own rebound and finish. It’s a testament to his talent that he was so successful with this, but it also shows how much he could improve. His effort, defense and free-throw shooting got much better this year. If he could add a jump shot and a right hand, he might be the national player of the year, let alone the Pac-12 POY. It’s not all doom and gloom if Ross and Wroten leave. This team should still be talented and improved. Abdul Gaddy has played increasingly well as the season has progressed, looking like an all-Pac-12 point guard in the last few weeks. CJ Wilcox doesn’t quite have the shocking talent and athleticism of Ross, but he’s not terribly far behind and will only be a junior. Suggs is in the same mode and will offer a steady head and hand. Andrews or Hikeem Stewart would need to step up for some depth, but that could easily happen. The front court would be a bigger question. Aziz showed huge improvement this year, and if he could continue that and make himself a threat offensively, he could be the best big man in the conference. Simmons had his moments before hitting a bit of a wall and losing some playing time, but he is still young and has that useful Gant-like skill set. It will be vital for Shawn Kemp Jr. or Martin Breunig to step up and develop as a legitimate first big man off the bench. That’s a good team, if lacking slightly in depth and star-power. The strange thing right now is that the Huskies have no imcoming recruits to augment the returners. I saw the other day that they’re one of only a few schools in the country with no commits yet. This is partly by plan. With only Gant graduating, there’s only one scholarship open, and that’s apparently being held for 5 star power forward Anthony Bennett. Bennett is no sure thing or even remotely close to it, but he seems to be the only guy out there that the Huskies would add to the team as it is currently. The recruiting class for 2013 has the potential to be huge, and it’s thought that Romar is happy leaving an extra scholarship open for a year if he doesn’t get Bennett or a similar level of talent. This would likely change if Ross and/or Wroten leave, as they’d have more open scholarships and the need for some extra depth. We’ll leave the potential recruits in that case for a later post. So enjoy this team in the one or two games left, especially Ross and Wroten. Hopefully they’re back, but don’t worry too much if they’re not. You can never fault these kids for leaving for millions of dollars, and there’s always someone else ready to take his place. But if you’re reading this, Terrence and Tony, how about you guys stick around and we make a run at the Final Four? Seattle could use a couple of new legends, not to mention a winner. Bad News, Good News, Great News! Ready for the bad news? It is a bleak day for Dawg fans, there’s no 2 ways around it. Yesterday’s loss was frustrating, untimely, but certainly not surprising, at least if you’ve followed this team all season. On one side, the Huskies exceeded pre-season expectations by winning the Pac 12 outright, a truly awesome accomplishment. On the other side, 20 of the Huskies 21 wins have come vs. opponents with an RPI of 75+, and time and time again the Dawgs have narrowly missed on opportunities to make a statement, and erase doubts. The biggest factor, for me anyway, is leadership. Gant is the only contributing senior, and I think he has done his best, but his personality is not that of a Brandon Roy, Will Conroy, Jon Brockman, Isaiah Thomas, or Quincy Pondexter. Gaddy, Ross, Wilcox and Wroten, for all the good that they’ve done in spurts, have not embraced the role of captain, the guy that pulls his teammates up in the face of adversity. The result is a plethora of head shaking moments, and some success based largely on raw talent like Lorenzo Romar has never had. It’s tough when talent does not fully translate, and potential is not reached. If this core stays together for another year and really gels, they are a top 10 team, but Ross and Wroten seem destined for the NBA, which nobody should blame them for. Now for some good news. If the Huskies do make the big dance, which is officially an “if”, their seed will likely be an 11 or 12, rather than a 9 or 10 which seemed possible a week ago. But does it matter? I would argue being an 11 or 12 seed is often better than being a 9 or 10, at least in terms of making a sweet 16 run. The recent numbers back this up. Since 2001, here are the seeds, and what % have made the round of 16. The great news? 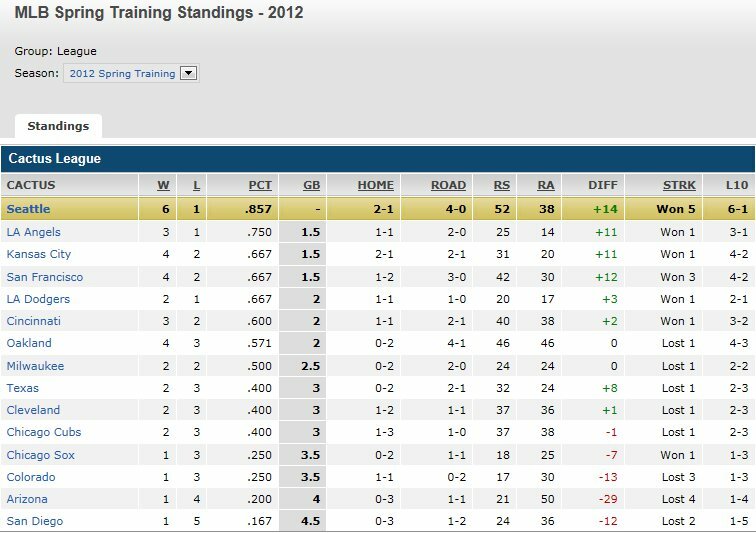 Check it out, your Mariners are in 1st place! Granted the games don’t “really” count, but we’ll take what we can get.